Hi to all my blogging friends. I did a post last week about spring cleaning and organizing little spots around your home...ONE PROJECT AT A TIME. Click here for that post. Why "one at a time", because if we take on too much all at once, we become over whelmed and quit. Well, to continue on with the organizing theme...today's topic is "Keep Like Things Together". What does that mean? It means...if you keep all of the same items in the same place, you won't be pulling your hair out trying to find something or trying to explain to family where something is. "it might be in the basement or it might be in that box out in the garage or maybe under my bed." Believe me I've been there. That's why a long time ago I organized things in the same category all together so it's easy for ANYONE to find something. 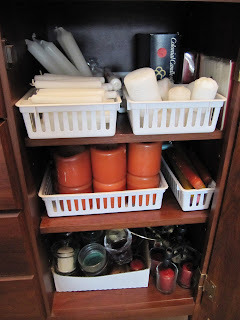 I'll be sharing different corners around the house like the basement, my jewelry, sheets and blanket, DVDs etc, but today I'll show you where I keep all my candles. This is an area near our front door. We're not a fancy house...very relaxed and casual. 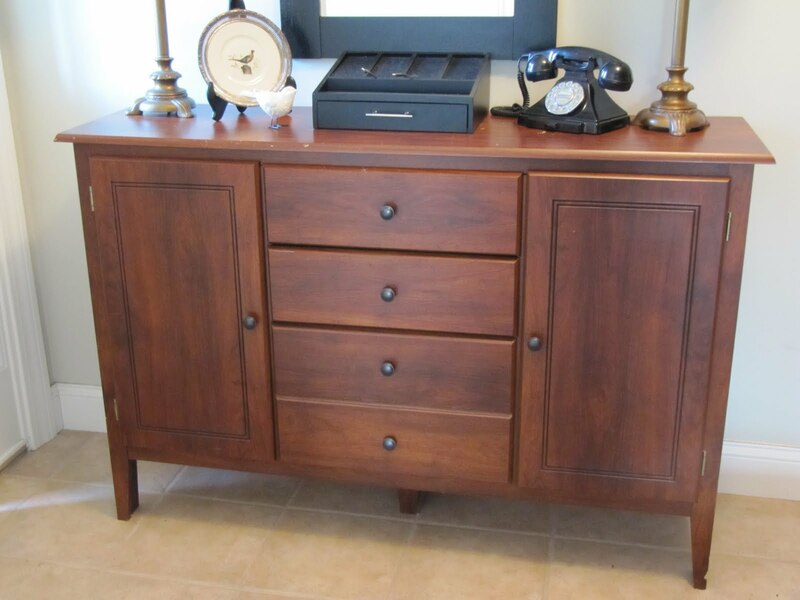 This narrow buffet was from Target a long time ago. Perfect size for this area. 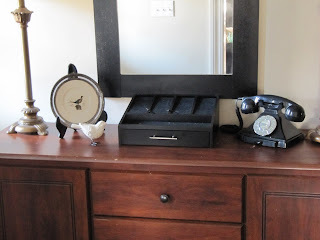 An old mirror from our old bedroom set, painted black. The wreath is from a thrift store...$2.00 and a crinkly ribbon from Christmas. This is the cell phone charger spot and where my husband keeps his keys. He puts them there as soon as he walks in the door, so we never hear..."has any one seen my keys?" and what the water from a plant did. That's why the phone's there...you never see it! 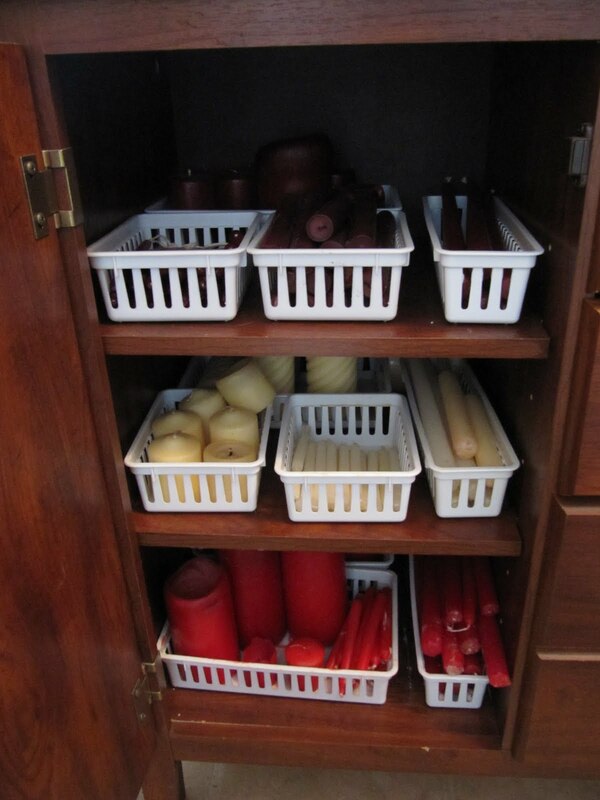 Hides all these candles. You may not have to store candles, but you may have a lot of something that is scattered around your home in different spots. 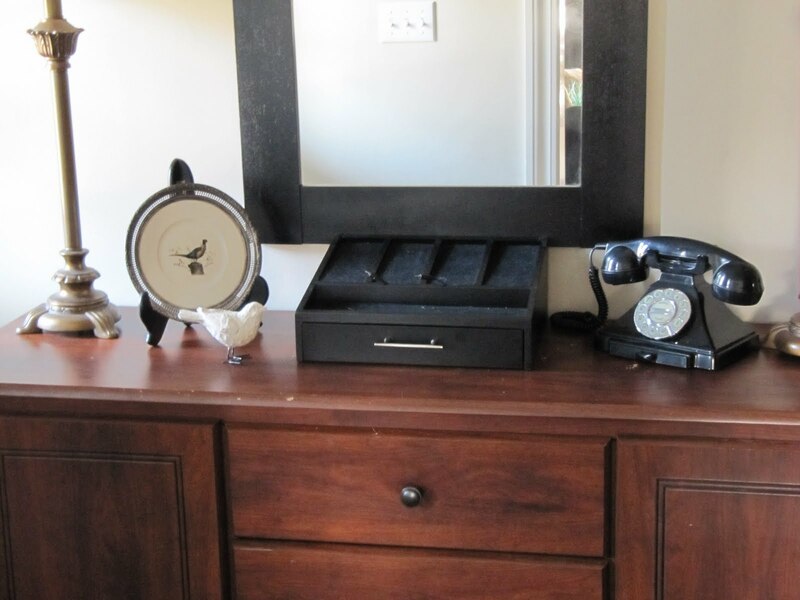 Gather all the same items together, sort through them, weed out old broken ones or things you won't be using and then organize the things you will be keeping. 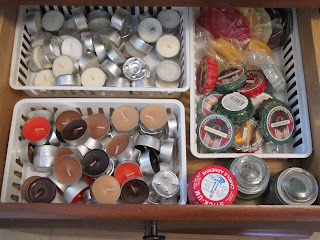 Tea lights and candle tarts. Larger candles and candle trivets. These are cheap plastic trays I've bought at Walmart over the years. 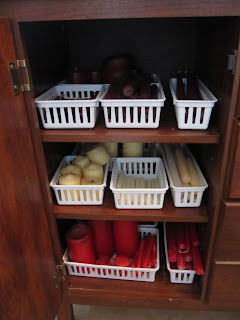 They separate all the candles by color and size. 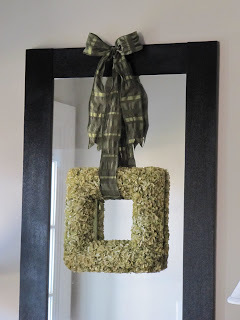 **My tip for buying plastic baskets or trays is to stick to one color. No matter where I buy them...dollar store, Walmart etc...I always buy the same color. White. That way I can use them in different places, mix and match sizes, move them around and they always match. 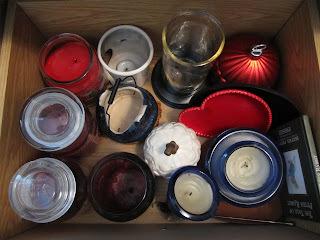 hide things in untraditonal spots...like candles near your front door...who da thunk it! I'm putting together more organizing tips, so stay tuned. 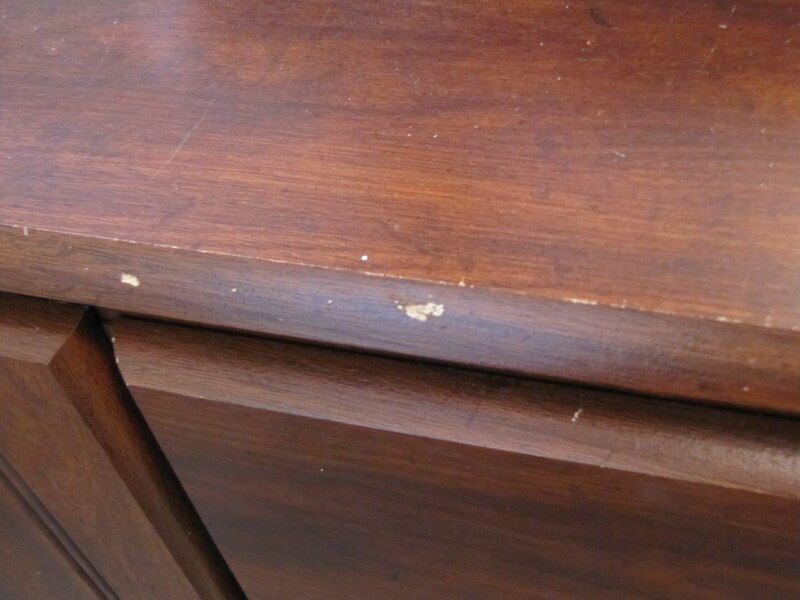 I like furniture like that, great place to hide things, but mine is not neat like yours, lol. Hi Karen!!!!!!! It is so good to be back here and find so many great, simple and helpful hints as always. And I am glad I just had lunch because that grilled sandwich just made my mouth watery!!!!!!! I have been away and now busy with school starting, so I will come back later and read some more of the posts that I have missed. Thanks for the fantastic organization ideas. I'll be looking for some of those plastic trays. Your house looks so wonderful today! We have been flooded out of our apartment and live in chaos this week. 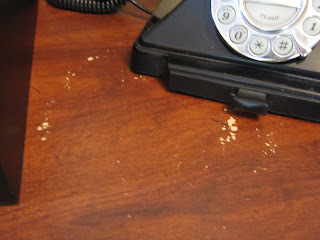 I invite you to visit my Blog and see the devastation! I could well use your organising skills at the moment! 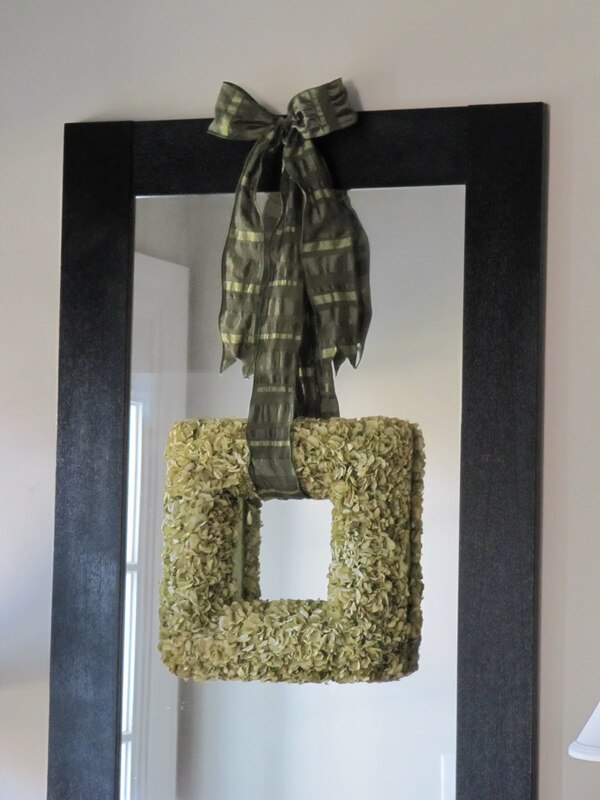 Your house has a beautiful looking entry way from what I see in the picture...that's pretty fancy to me! Perfect storage solution and smartly done too. I have my candles all in one spot but I have a box of matches (it's high enough where kids can't get to it) there too in case of power outage and a flashlight with good batteries in it! 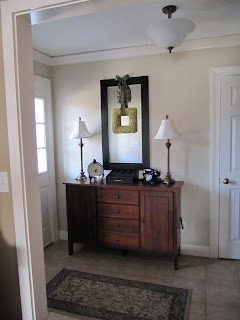 I love the cell phone charger idea by the front door. My door by the garage has a shelf with some of these baskets and we throw our gloves, hats, keys, etc. in them so they're always handy when you need them! 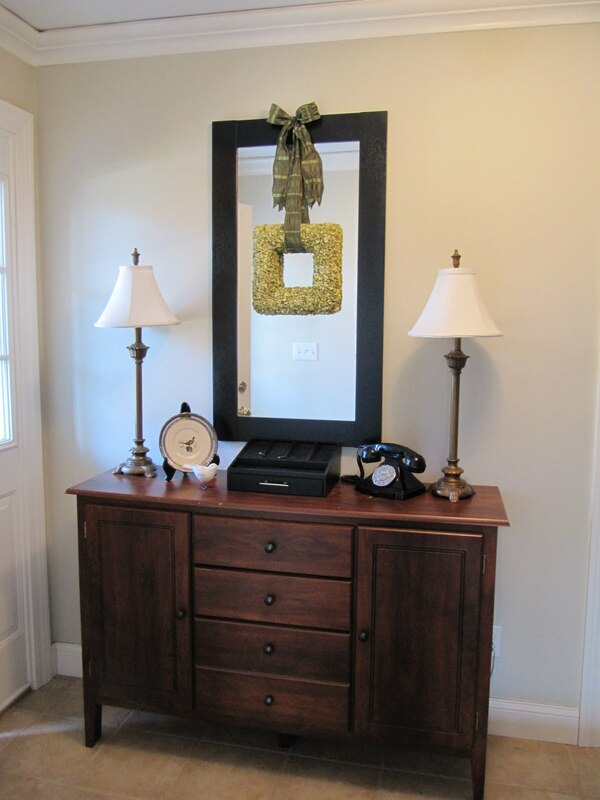 I have a buffet (really an old chest of drawers) and a mirror at my front door. It's where I keep my candles too! Although not nearly as organized as you! Wonderful, and in addition when your guests enter it smells so good! What a great post! Thank you for your wonderful ideas and storage solutions. Wont you just come and organize my home for me? Not ashamed of beggins. 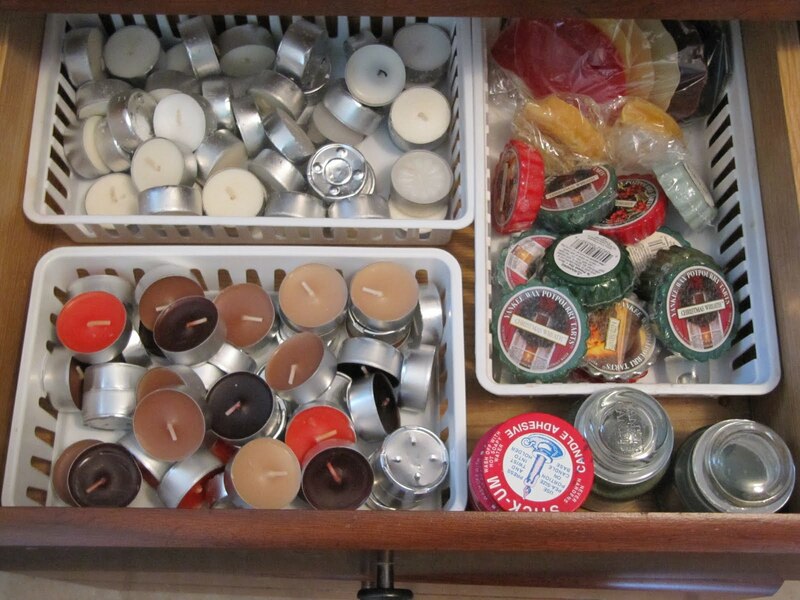 What a great stash of candles you have. Either you are a romantic or there are lots of outtages in your area. LOL. 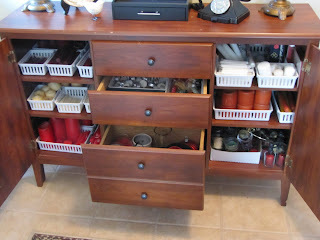 Yesterday I started using your storage tips for my sewing area. Doesn't look nearly as stylish as yours, but I'm on my way. Thanks. 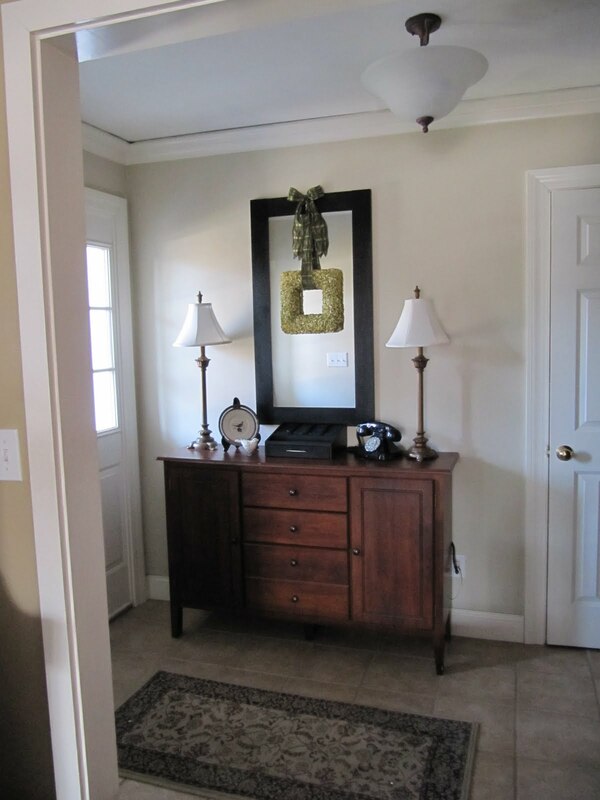 Your entry way looks lovely. I keep all of my candles in a cabinet underneath my breakfast bar. It's a little hard to access but they're all in once place like you recommend. I like your baskets better than the rubbermaid containers that I use. Great ideas! Thank you for sharing! Great tip!!! Thanks for sharing! Oh, another great organizing tip! Thanks, and keep them coming, please!! I'm glad to see someone else loves candles as much as I do. Plus I really like the idea of buying the same colored baskets. I have a bunch of mismatched ones. Almost tempted to paint or make matching fabric liners. I always enjoy reading your blog. You have great ideas. Oh I am so envious of your organization and tidiness!! Thanks for the advice on putting like things together in one place and for tackling one project/area at a time. My house is so cluttered right now. Love all your tips and ideas-- thanks for sharing them! I just love the way your mind works! I will be watching for more tips. Love, love your site....keep the ideas coming. Thanks so much for the tips...I really need these ideas. Keep up the great work. I am trying to do the same organizing - like stuff in one place. Unfortunately, when I decide what goes in one spot, I clean out the area and then I'm left with boxes of stuff to find a home. Of course, there is a box of stuff to give away! I also have a cabinet with many small drawers by my front door and I have done something similar. One drawer is for my purse and keys, another for maps, candles, flashlights and spare batteries, emergency radio, gloves, hats, scarves, letter writing stuff, etc. Life became easier when i could go to one place and always find a pair of scissors, tape, envelope. I always learn so much from your posts...even if I don't always comment! Thanks...and please keep the tips coming! I can't believe how organized your buffet is... all the little baskets. Great storage area. 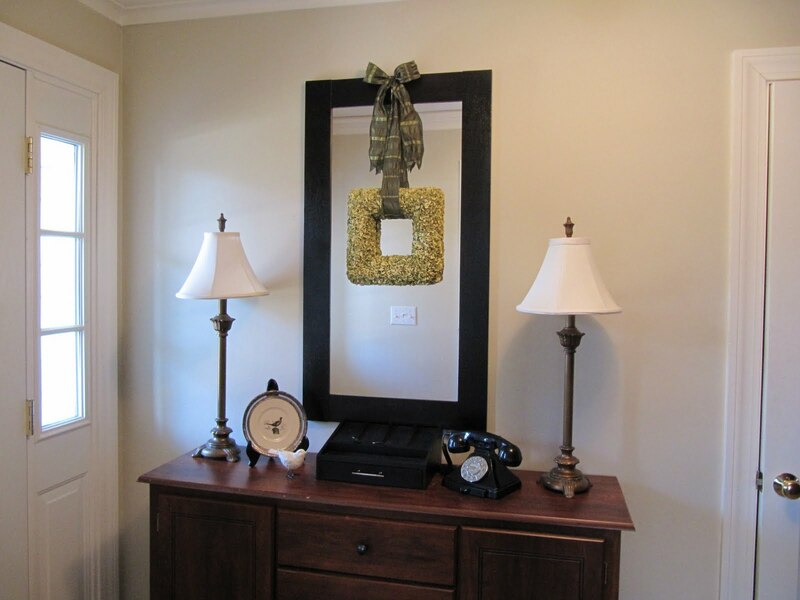 I LOVE the square wreath/mirror combo. Beautiful! You're so perfect and organized... I would like to be too but by now... I can't... neybe one day. Nice weekend. I have a similar set-up for my candles, but I like yours a lot better. So, I'm going to use your ideas to upgrade my set-up. Love your blog. So fun to read, especially your "Organizing" posts.Thanks so much for sharing. You are too clever! When I saw the first pic of your buffet, I thought, "I would keep all my candles in that if I had one!" I love the color on the walls in your entry, what is the color?